AdvaClear® is a nutritional supplement that promotes health by supporting certain detoxification pathways and promoting the activities of liver detoxification enzymes. GlutaClear® is a supplement that supports the production of glutathione, an antioxidant that plays a big part in protecting cellular health and detoxifying harmful compounds. Renagen™ DTX is another dietary supplement that consists of a combination of traditional herbs and nutrients that support kidney detox and antioxidant activity in the kidneys. 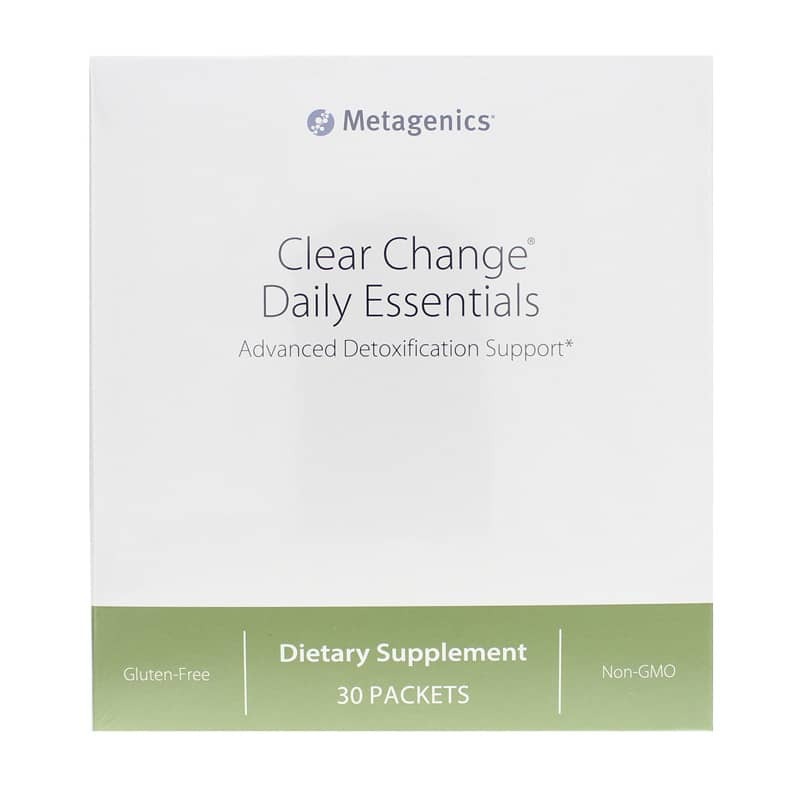 Metagenics offers a natural supplement called Clear Change Daily Essentials that seeks to provide advanced nutritional and detoxification support. 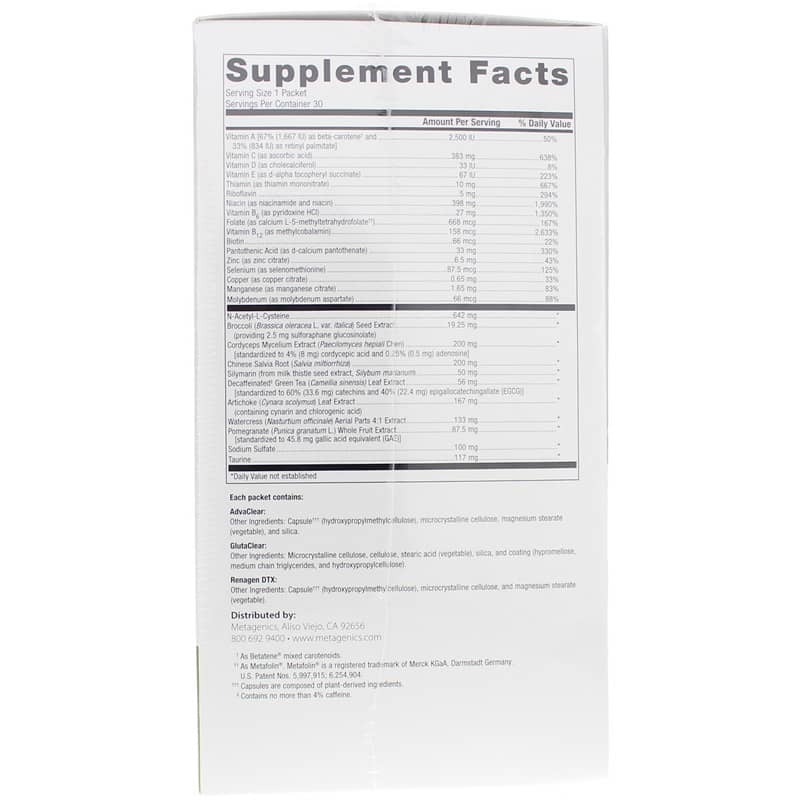 In addition to detoxification, this supplement also seeks to support cellular health, antioxidant activity and overall wellness. Suggested use is to take one packet daily for one to two months or as directed by a healthcare professional. 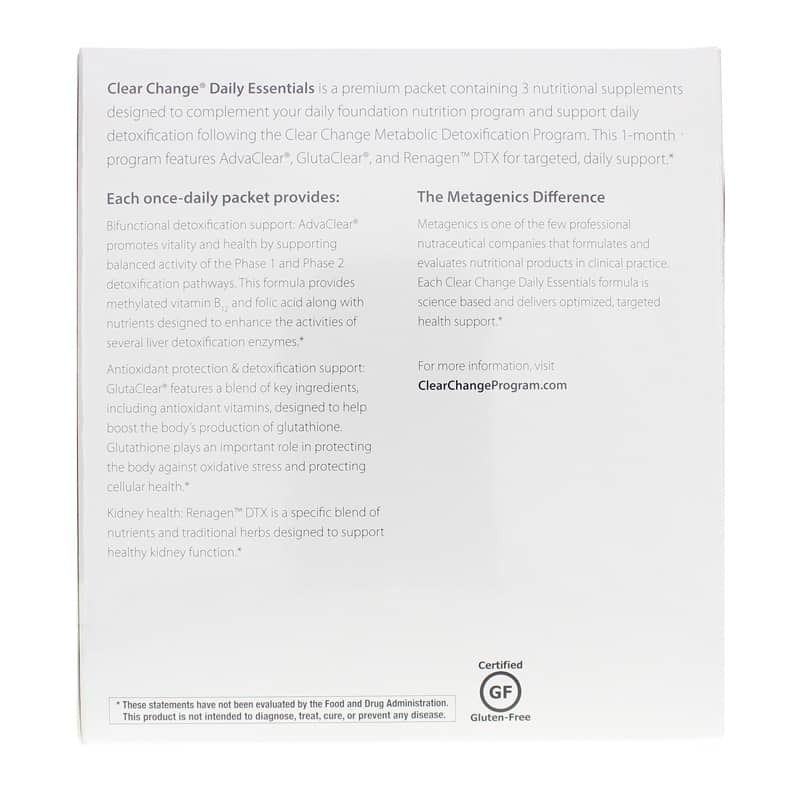 If you're looking for a natural supplement that seeks to provide advanced nutritional and detoxification support, check into Metagenics' Clear Change Daily Essentials. Order online today! AdvaClear Other Ingredients: Capsule (hydroxypropylmethylcellulose), microcrystalline cellulose, magnesium stearate (vegetable) and silica. GlutaClear Other Ingredients: Microcrystalline cellulose, cellulose, stearic acid (vegetable), silica, and coating (hypromellose, medium chain triglycerides, and hydroxypropylcellulose). Renagen DTX Other Ingredients: Capsule (hydroxypropylmethylcellulose), microcrystalline cellulose, and magnesium stearate (vegetable). Adults: Take one packet daily for one to two months or as directed by your healthcare practitioner. 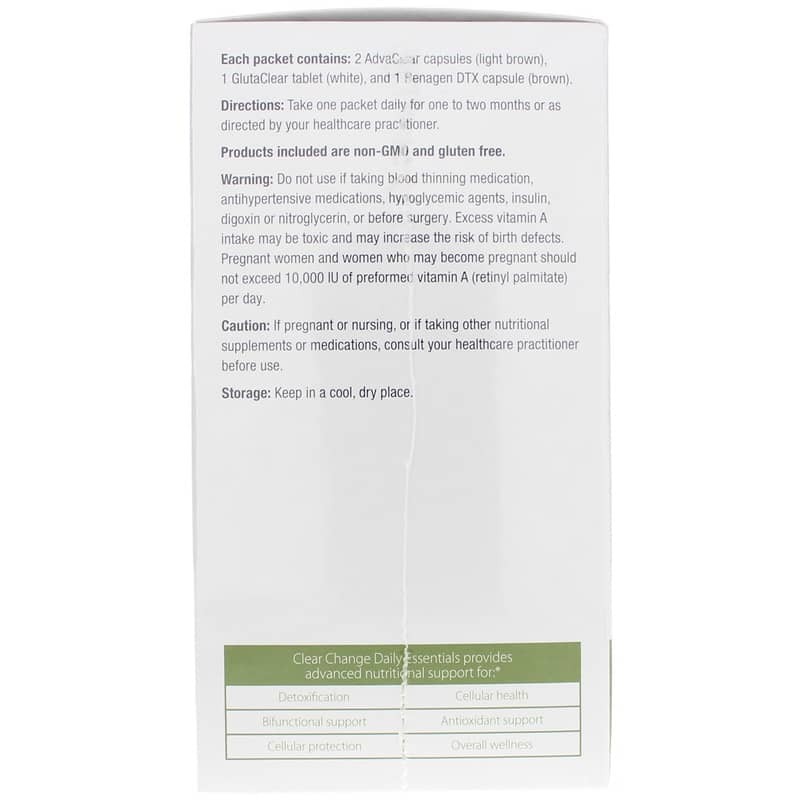 Do not use if taking blood thinning medication, antihypertensive medications, hypoglycemic medications and insulin, digoxin or nitroglycerin, or before surgery. Avoid use in patients with history of hormone-sensitive cancers. Excess vitamin A may be toxic and may increase the risk of birth defects. Pregnant women and women who may become pregnant should not exceed 10,000 IU of preformed vitamin A (retinyl palmitate) per day. Keep out of the reach of children.